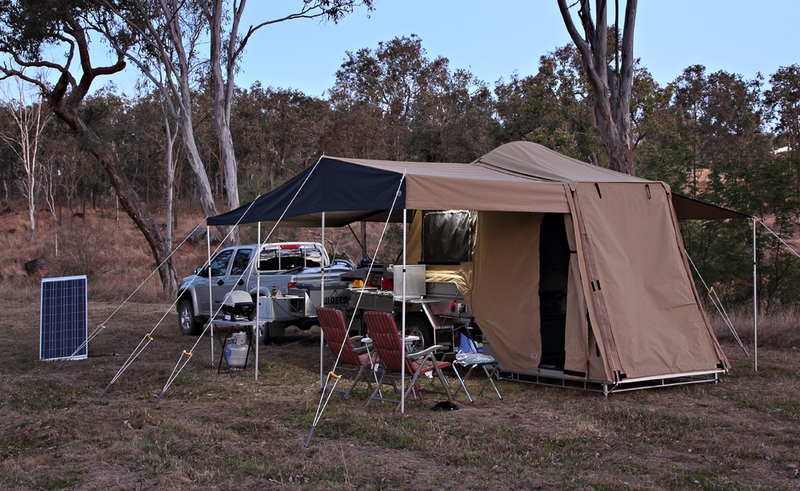 The guys at Aussie Swag are great, very helpful, great customer’s service and there isn’t anything they don’t know about camping trailers. We looked and/or researched pretty well every hard floor camping trailer we could find. For us we narrowed it down to 2, Aussie Swag won out with their quality and high standard of workmanship, this is not to say the other hard floors aren’t good trailers the Aussie Swag just suited our needs the best. We wanted a quick setup and pack up, everything we will add to our setup will also be quick, that’s the plan anyway. That was one of the really great things about the caravan, setup and one night stops were very quick. Another great thing about the van was it was great for getting out of the weather and away from the flies; the camping trailer might be a challenge in that respect, only time will tell. 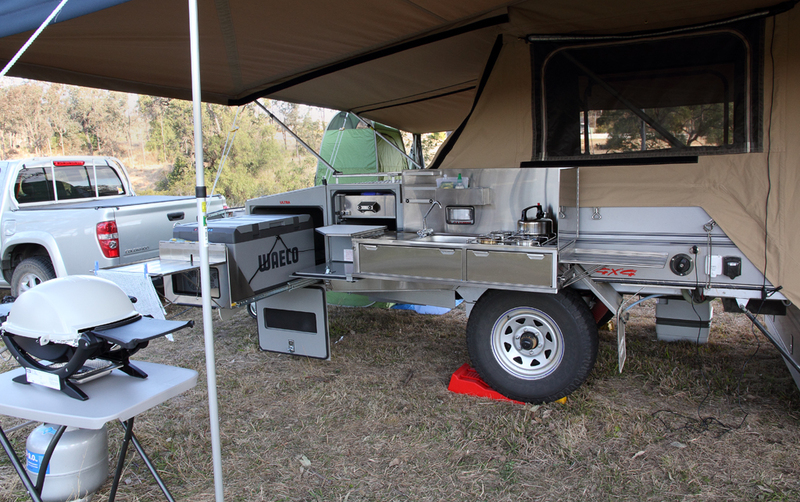 We pretty well went with the “Ultra E”, with a few changes, took off some bits we didn’t want and added a few we did, see the Aussie Swag web site for full specifications of the camping trailer. For those cold nights in the Outback of Australia we have had a gas heater installed, we have upped the gas bottles to 9 kg to allow for the heater. We had another battery installed bringing the number to 3, a few things had to get moved to allow room for the 3 batteries and we went for the 1500 watt inverter. We had 3 105 amp hr. batteries installed. 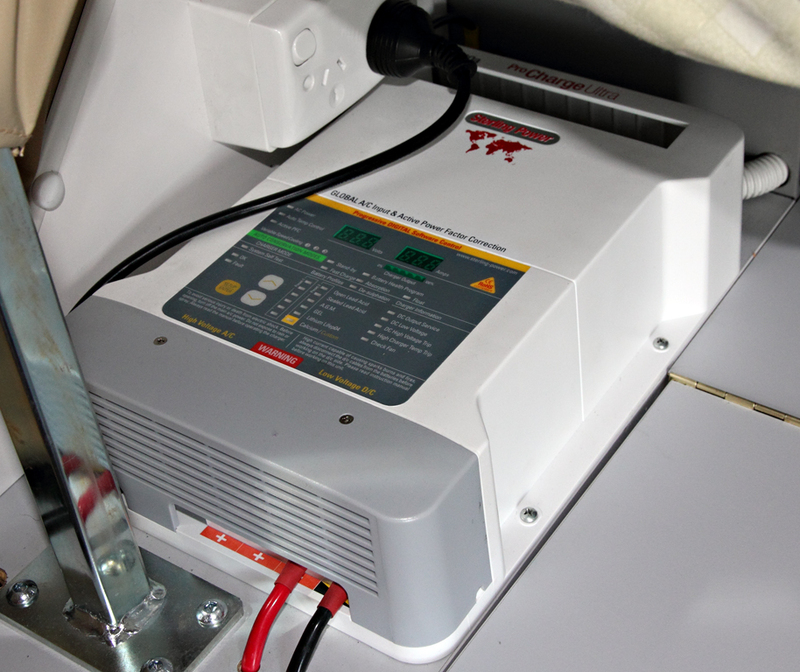 New Bainbridge 60 amp battery charger. We opted to buy the trailer without a mattress so we could put in the mattress of our choosing. After lots of mucking around with different mattresses we have settled on a latex mattress with a zip on memory foam overlay from The Mattress Company at Logan. We have our own 20i Honda Generator so didn’t need that, we also didn’t get the ensuite; we are opting for one of those quick pop out ones and a few other minor changes. 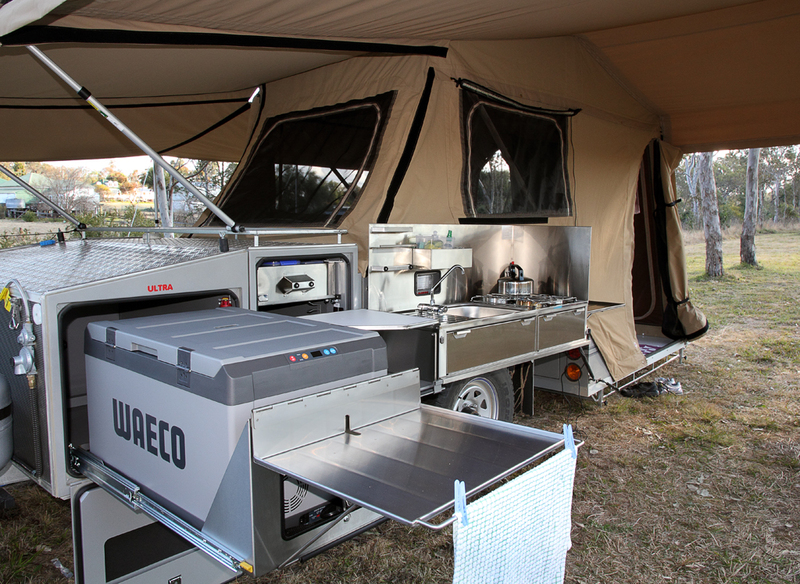 For people who aren’t familiar with the Aussie Swag camping trailer the kitchen is stainless steel with 4 burner gas hotplates with a grill underneath, has a sink with storage under it for all our plates, cups etc., it also has a flip out short bench. It slides out and swings around to run along the camper body. Our 2011 model has a stainless steel splash back and wind break. There is also a 100 lt stainless steel pantry draw that sits just above the kitchen, when it’s in the camper, to access it just slide the catch and it slides out smoothly. All models from ours onward have different taps, they no longer use the flick mixer type, they have changed it to 2 tap version one as it’s stronger. The 80 lt Waeco fridge/freezer also slides out from a vented storage box, they now have a stainless bench that sits on top of the fridge that flips over and is braced back to the fridge box. We went for the short bench version but you can get a longer one that requires screw on legs to help support the length, we opted for the shorter one because it was quicker to set up. Even has a place for the t/towel with a rail at the end of the shelf. Overall we are very impressed with the quality and workmanship; they are a good tough off road trailer that is going to take us to some awesome places. 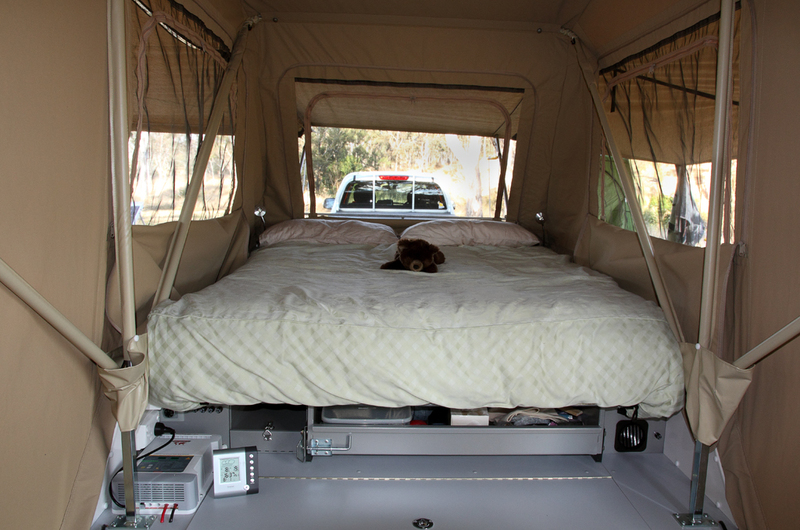 We will miss some of the conveniences and quickness of the van, especially the setting and packing up parts but the camper will get us into those hard to reach, beautiful, remote places of Australia. With our Baby Webber Q it completes a pretty snazzy kitchen. We did a lot of research on the tow hitches, each one having it’s pluses and minuses, we had read a lot of people’s experiences on forums on the Treg Hitch and Hitchmaster DO35 that seem to be used by the majority of camping trailers out there, it kept coming up in the forums that they can be hard to hitch up without some form of assistance also, they can be difficult to unhitch on a slope, when covered in mud or dust etc. So we have gone with Oz Hitch, will give feedback on the hitch once we have used it for a while. We are towing the trailer with a 2011 Holden Colorado 4×4 Twin Cab Ute.